What’s on the menu today? The Dorfner Catering App for the canteens that we run allows you to view your menu at any time and approve dishes, and means that you will never miss a culinary promotion again. 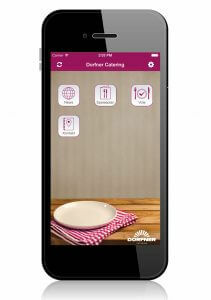 The app is easy to follow, has an appealing design and provides much more than just the planned lunch menus. Different modules can be integrated into the app on request, allowing you to offer guests even better service.For example, the menu plan not only shows the dishes that will be on offer in the coming weeks, but can also provide reminders when favourite meals come up. The “Allergy profile” module is also particularly popular among customers. The user sets up a personal profile with allergens or additives that they cannot eat or do not like. Based on this, they are then only shown the meals that they can eat. In addition, guests can even influence meal planning: they can use a vote function to choose a “dish of the week”, which will then be on the menu plan again at a later date.